I could just hide the sidebar in landscape mode!!! I wanted was an app that would generate White Noise continuously until I told it to stop. This program is too complicated to do that or to even handle it. I wasted my money and now I’m looking elsewhere. This app is very relaxing. It makes people fall asleep easilly. I recomend chimes chiming. A feature that I was hoping for was sleep enhancements which would slow down the sound over the course of 30 minutes. Another feature that I requested was to have the option to change the pitch and speed separately. Imagine using the chimes chiming sound at a very slow rate, how relaxing would that be? Sleep soundly on the road with the help from this app! When I download sounds from White Noise Market (gray icon) & hit “open” 2 go from the gray 1, Market, 2 the green 1... CRASH. Pls fix. Thank u.
I’ve used this app for years, and enjoyed it but it seems impossible to upload your own sounds or communicate with the authors. I have been suffering mild to moderate tinnitus. I find that violet noise masks and relieves the ringing. I think this app is 99% perfect. The one thing it needs is instruments. Instruments are soothing to me and most of the population. The app is great but instrumental sound would make it perfect. This app forces you to download White Noise Market in order to take advantage of the online sound options, which forces an amazing amount of ads on users of this app. It’s unfortunate when when you pay money for a premium app. I like that i can combine and modify the sounds to make the perfect peaceful sounds to go to sleep with. I bought this back a few years ago when I lived with my boyfriend at the time who would stay up all night playing video games. He was loud! I'd be downstairs and all I could hear was him!! This helped me sleep at night and now I've used it so much, I need it to sleep. Best purchase ever. Helps my baby sleep too now that I have a little boy. Helps keep him sleeping longer during nap time! Super awesome useful app. My favourite sound is "airplane" which is a nice white noise. It says I've listened to it for 300 hours! I never thought an app could really help me fall asleep until I tried this one. With so many sound options (and downloadable ones) it would be hard not to find that perfect sound to relax and fall asleep. Great for travel! sleep, or when you just want some calming background sound. I especially like the ability to combine sounds and create an immersive surround-sound experience. This app is fabulous. The variety of sounds is huge. The sounds are high quality, with no weird looping artifacts. Best invention ever... I use it every single day! Best white noise app EVER! Best choices, best graphics, best sound. I couldn’t get through the day without it! Love it!!! These sounds make you go to sleep instatlly. Want details?ok,I put up the sounds and I went to sleep in a instant! I couldn’t survive travel without this app. it is a godsend. I’ve been using it for probably 5 years now. I’m a very light sleeper and this helps me sleep so much. I use it at home and when traveling. I’ve hooked several family members on this app too. Professional pilot that has to deal with noisy hotel guests and staff across the world. This app plus earplugs is a godsend. Won’t leave Home without it. Frequent updates, flawless functionality. I have bunch of neighborhood and in home sounds that used to make me crazy. Trains, home settling, kids animals running wheels, wind, dogs licking (all night). I used to use fans to drown the noise. Now I just fire up my app and it saves me from all the sounds and the electricity or running those fans. Thanks for the great app!!! I’ve had this app for many years, and I absolutely can’t sleep without it. Great job! Every sixty seconds, the “Light Rain Pouring” sound includes some sort of alert sound / bell. How does this not get noticed in a ten year old app whose sole job is to play soothing sounds? Love this app, but after last update it’s quieter. I can hardly hear it on my bedside table anymore on full volume, whereas before I didn’t even need to have the volume all the way up. Not really doing much for me if I can’t hear it. Brown noise BETTER than White!!! Wind through trees is awesome too! Once you have switched from the over-rates white to BROWN! You'll thank me later. The app is worth the money because I can finally blast Power Glove by Knife Party out of my Bluetooth speaker. Not only that but when it fades into full volume, it's less of a shock. 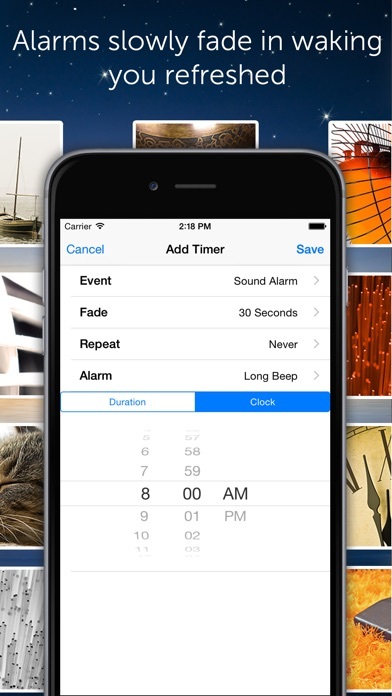 My only recommendation for the developers is to add a "Change Volume" alarm so that I can go to sleep with quiet crickets, and wake up with a loud alarm. Brown noise is our jam. 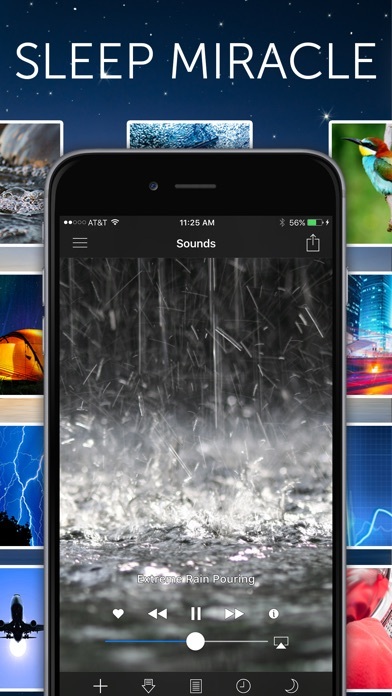 Best white noise app by far! I use this app every evening and it is very reliable and perfect for what it is. Thanks for developing. Beyond a doubt the best app ever! 50 sounds to choose from and guaranteed to help sleep. Don't know what I would without it! I use this app every night. I wouldn't be able to sleep without it. I used to use a noise machine but this app is just as good and has many more sound options. I've always been a very light sleeper so I tried the free version. I upgraded to Pro very soon after. I use this app every night. I also use it during the day to relax or unwind. I enjoy being woken up slowly by different sounds and there's so many different options available. I highly recommend this app. Very versatile and easy to use. Suits my needs. I primarily use this app as my alarm clock. The option to have the sound begin quietly, then increase the volume is great. No more bring frightened awake by a blaring alarm. I use the sounds while working, drowning out background noise or eliminating silence. 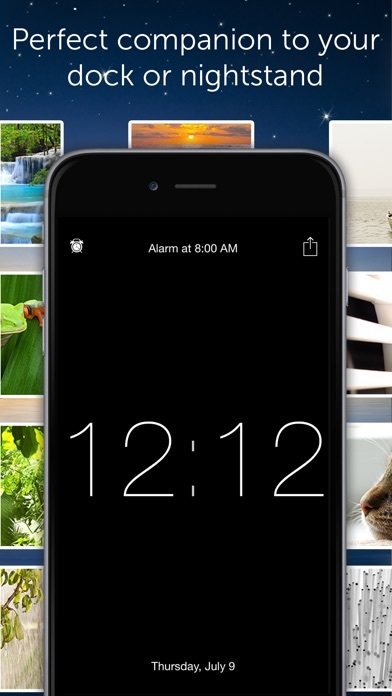 I've got five kids and little time to waste, so this full-featured app is perfect for helping me get to sleep quickly and deeply. I have been using this app nightly, to help me get to sleep, for several years. I use this every night. Mix of rain storm & thunder. Helps me get great sleep. Our family LOVES this app! We all have our own sound we can fall asleep too. Makes for one happy family! Wonderful sleep in enhancing sounds (my favorite is ocean waves crashing – reminds me of being on the beach.) Has a beautiful nightstand clock also which I like very much. I never leave home without it! I love setting the timer and falling asleep to the mixes I create!! I recorded a loop of my cat purring a few months before she passed. Being able to capture a moment of happiness and contentment with her purring and napping by my side using your app is truly something special to me. 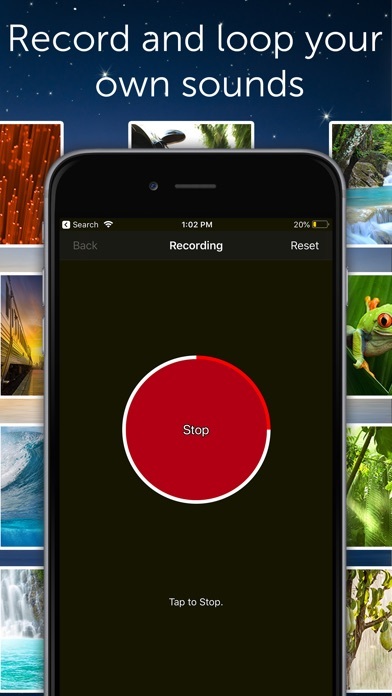 Thank you so much not only for this app, but for adding the ability to record your own loops. The only request I could make is support for the new iPhone X other than that this is truly an excellent piece of software and now completely indispensable for me. Thank you! I've purchased a few different white noise apps and this is by far the best! I highly recommend it plus you can mix and match your own it's pretty awesome! I love this application. In combination with the sister download app this app is worth the money. The timers are phenomenal. I love the timer that starts the application on its own. Great background noise for sleeping. I fall asleep to this and it blocks out noises from outside my apartment. Highly recommended!! Worth the money for Pro; love downloading new sounds and making custom mixes for the sleepy times. Works great when anxiety makes sleeping difficult. Helps me sleep every night! Thank You! As requested in a pop-up message on this app, I am reconfirming my rating above and what I wrote in the following sentences. 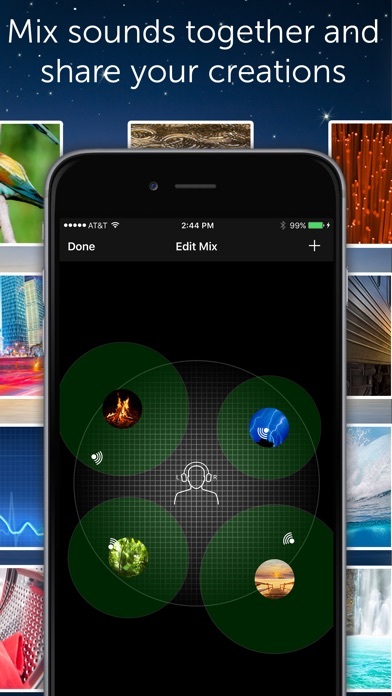 I work at home, so I use this app to block out household noises and the conversations that tend to be distractions. It is also a sleep aid, especially since I am an early-to-bed kind of guy, and my wife tends to be a night owl. I used to use an app called Simply Noise, but it was not updated to fit the most recent iOS versions. I'm using White Noise Pro, which is much more diverse than Simply Noise and allows an ad-free experience. The developers have combined photos and sound to provide a very pleasing experience. There is a version for Mac, which I also use with satisfaction. A great app. Awesome app. Most used app on my phone. Love this thing. White Noise Pro is simply awesome! Terrific options for sounds. Great user functions. Slick interface. I am using this app to combat Tinnitus and i love White Noise Pro. This is an amazing app...LOVE IT! I had the old “storm” white noise app for years; my wife and I loved how it enabled us to get an undistracted night’s sleep. So I was sad when I had to delete it when I upgraded to iOS11. Fortunately I found this app for the same price I paid for the old one. It completely does what the old app did plus so much more. I am blown away by how powerful the mixing capabilities are. I doubt I’ll ever use them all, but I did discover that mixing bubbling brook softened rain on metal roof just enough to let me enjoy the sound all night; otherwise the metal roof rain was just a little too sharp. The app has a better all-around look to it; I appreciate the new clock look. This is the app I listen to more than all the other apps on my iPhone combined; I can say that it wears well. Highly recommended if you want to finesse your own white noise experience. This is the best perfect app I have ever downloaded. Perfect for lower stress levels and for getting a quick power nap. So pleased to have stumbled across this app and my thanks to the developer! I use three sounds together and love each one. I have Tinnitus and the different sounds distract me and I can sleep well. I highly recommend this app. I use this each night. Can't say enough nice things about having this App. Recommend it to everyone because of its versatility. Thank you !! So, just to make it clear, I love the App, but version 7.3 is misbehaving, chewing through Battery power all day, like it’s playing silently all the time. The App has always had its quirks, it changes brightness and sound settings for the entire phone rather than just itself, which would be ok if it restored them when it was in the background, and it doesn’t. The developer has been unresponsive for months, not a good sign. I am leaving this review in sheer desperation, in hopes that it will spur change. Sigh.